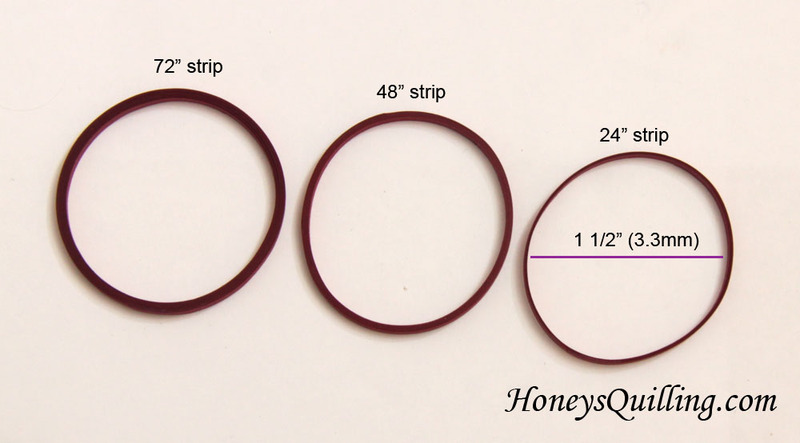 The other day someone asked me how to make sure that a big circle for earrings would stay in a perfect circle shape. In addition to giving an answer, I thought I’d take the opportunity to share some photos on the blog in case others had the same question! 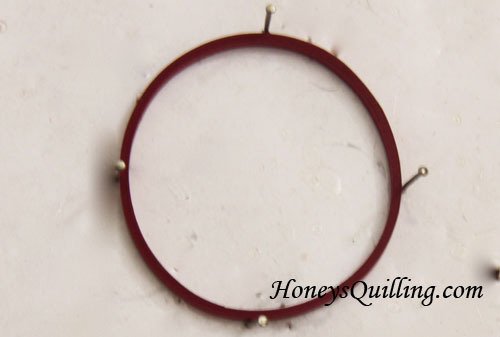 To make a big circle for a border for your earrings, wrap the paper strip around an object. 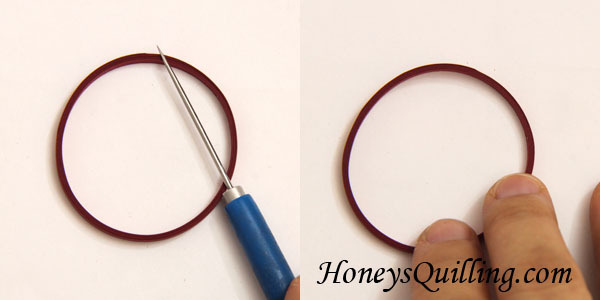 You might have a quilling form that is the right size, or you can use any object you have. Here I am using a lip balm container. Once you have glued the end of your strip down (it works best to glue with a torn end for a smoother look) you may need to flatten down your shape to make sure all the layers are even. This will give a smoother look to the edge. 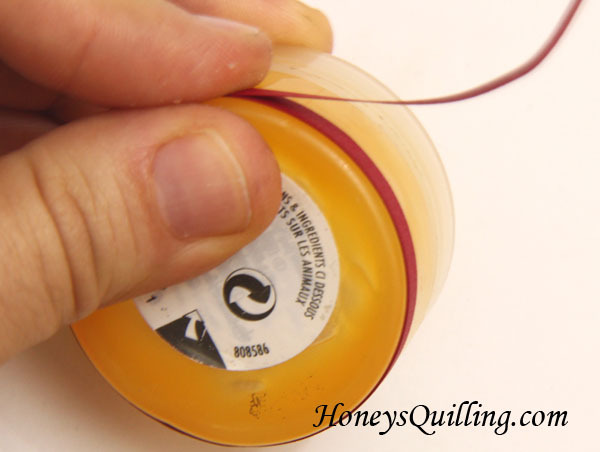 You can use a needle tool or your fingers to smooth down the edge. Here I made the same size circle with three different lengths of paper. The one on the far right was made with a 24″ length of paper. The middle with a 48″ strip, and the one on the left with a 72″ strip. You can see very well that the one made with a 24″ strip is loose and floppy and out of shape. It is very difficult to work with this floppy shape if you want your earrings to be perfectly circle. The 48″ strip is fairly sturdy, but can also be bent out of shape if you are not too careful. The 72″ strip is MUCH more sturdy. Both will work fine for jewelry, especially if you follow the next step. 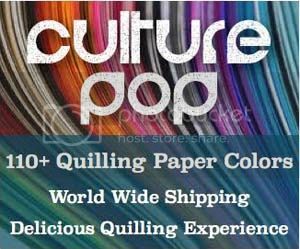 To fully make sure your circle stays in shape while you are adding the rest of the pieces, pin it in place on your workboard (you can get a quilling workboard here at Custom Quilling, or here on Amazon ). Keep the pins in place until the other pieces are all glued in place and it is fully dry. If you have any tips of your own on how to make a sturdy circle, feel free to share in the comments! Or if you have a question about jewelry making that you’d like to see a post about, let me know! Find more tips and tutorials about making quilled jewelry here. I have just started using large circles and other shapes as sturdy outlines to some holiday ornaments. I used a very similar technique and I’m glad I wasn’t too far off! Thanks for the comment – I checked out your etsy shop – love your work! Thanks for sharing this Honey! This is such a great post. I am a pinning queen. My technique for quailing is so unlike anyone else’s that I have developed neat tips and tricks like the one you are using here with the pins to hold the circle in place. 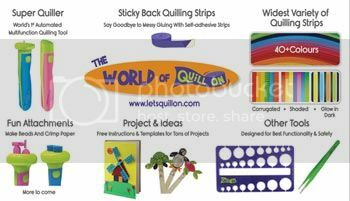 I have seen you use this before, I believe when you were instructing people how to create their own quilling tools and boards. This is something I will be using in the future when I make these types of circles. I have noticed that my circles look so much better if I don’t glue as I go, and if I can pull it off and flatten it. However, I have also noticed that when I glue as I go I end up with a much sturdier piece of quilling. Thank you for sharing!!! Yeah, when I make triangles and squares with the border buddy it’s definitely worth the slightly uneven edges to make the shape more sturdy. but with circles it’s a toss up! For myself I don’t glue as I go with circles, I just depend on the thicker paper to get me a sturdy shape. But with the other shapes I glue as I go. Thanks Honey! I just got done reading this post about mixing the PPA with water. I did something similar to that with a glaze I was using. It was so thick I put it in a squirt bottle and thinned it out with water. It worked but not well. In fact you could see where there were water marks… most likely bubbles, that changed the color of the paper. It left a neat effect like your earring but it is not something I would do again without expecting that outcome. I love that you share the stuff that doesn’t work as often as you share the things that do. I am getting close to doing the same with some of my newer blogs coming up. I will be working on them today. Hi Honey, what are your thoughts on sealing the circle before adding other pieces? It was a thought that crossed my mind whilst reading this tutorial…..thanks for sharing. Hi Michele – actually I have used that exact technique on occasion! It certainly can be helpful for certain designs. For most designs I don’t find it necessary, but if a lot of pieces are being glued inside of a shape it can be helpful to make sure the shape is sturdy first.